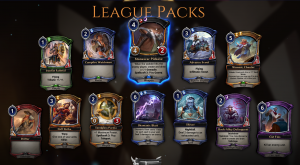 It’s been a while since I had the time to do a sealed article, so this will cover August’s pool. I was on vacation the first week of August, and then had to play catch-up at home for a bit, so my play for the month was a bit disjointed. First thing’s first: What’s my fixing situation? That’s always good to know, so that you can evaluate any potential splashes before dismissing a faction entirely. Unfortunately for me, the answer to my question is “not great.” I have only Praxis and Skycrag banners. No Strangers, and none of the Time cards that fix. Right away, I am able to dismiss Time. There’s simply nothing there that’s enticing. 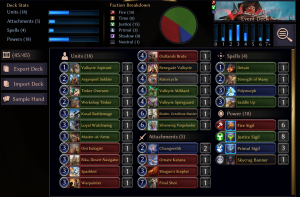 It has some solid multifaction cards, but there aren’t enough Time cards to support it as a main color, and the good multifaction cards are cheap, which means I’d want to play them early in the game. I can’t do that reliably if I’m splashing them. Awakened Student is amazing on 2, not so much on 6. Primal has a pair of Changeestiks, a Polymorph, and some really mediocre units. It’s definitely worth keeping the Changeestiks and Polymorph in mind, but I’m almost certainly not adopting Primal as my main faction either. Fire is the next weakest faction, at least until you glance at the multifaction cards and see Rizahn. He’s a tremendous bomb, representing both card advantage and a very lethal win-con. Renegade Valkyrie is also very strong if you have any way to pump it. I have a couple of good rares in Fire as well, with Rika (very good with Changeestik!) and Shogun’s Scepter. Final Shot is a very good, well, final shot, especially on a Renegade Valkyrie. Outside of those, however, Fire is riddled with subpar units. Rizahn and Shogun’s Scepter are very much not splashable, meaning that I will have to make Fire a main faction if I want to play them. Shadow also has some reasonably solid cards. 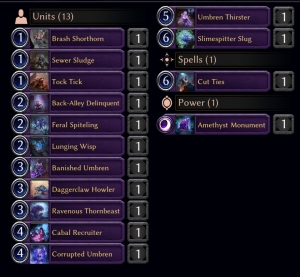 Slimespitter Slug, Cut Ties, and Corrupted Umbren are all very good reasons to play Shadow, and Amethyst Monument is a nice piece of anti-flood technology. Like Fire, however, there is a very steep drop-off in unit quality after the first few. And, like fire, two of the three biggest reasons to be in Shadow have a double faction requirement, so no splashing there. 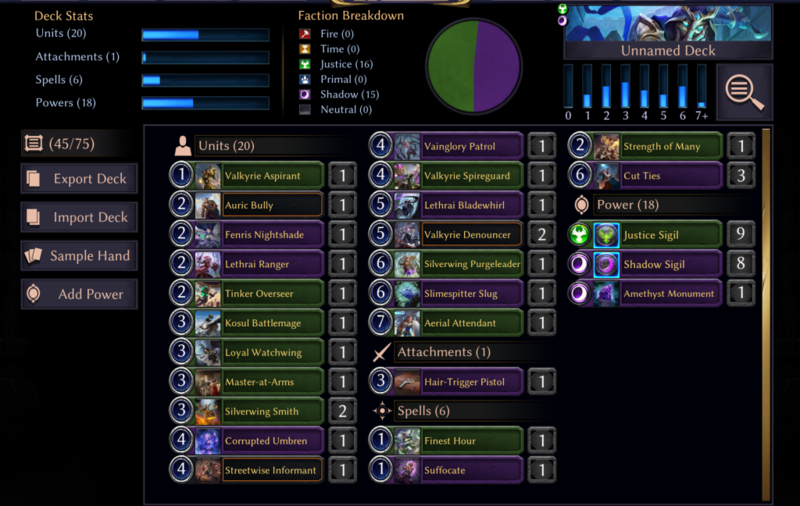 Since I’ve pretty well narrowed things down to some mix of Fire, Shadow, or Justice, it’s worth noting the two very powerful Argenport cards in the multifaction stack as well. Minotaur Informant and Valkyrie Denouncer are strong pulls in that direction. Last, but certainly not least, Justice. 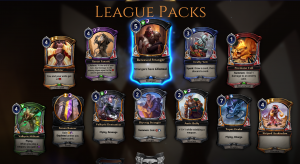 I feel like I’ve played Justice in pretty much every league so far, but I don’t think that should be a huge surprise. It’s got tons of flyers and weapons to put on them, backed up by efficient combat tricks. 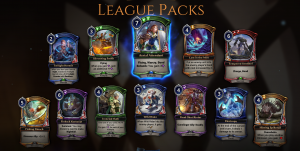 My pool has, for good flying threats, Valkyrie Aspirant, Tinker Overseer, Loyal Watchwing, Valkyrie Spireguard, and a Purgeleader. I’ve also got several ways to buff them, and some good ground creatures to round it out. Strength of Many and Saddle Up are two great ways to push through damage, and both potentially combine very well with a Renegade Valkyrie. I don’t have any relic weapons or anything like Vanquish, here, so I’m basically all-in on units, but the units are very strong. 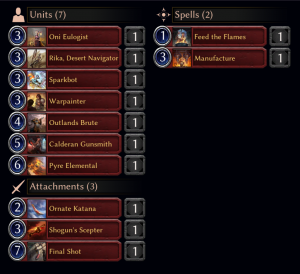 Note that I elected to splash the Changeestiks and Polymorph in both lists, even with no/little fixing. That’s because both faction pairs were just not deep enough to flesh out a deck. Sure, there were other cards I could play in those slots, but they were so far beneath the power level of the Primal cards that I think a loss in consistency is worth it. Plus, I’m light on removal in general, so having more answers to a big Tribute threat is important. 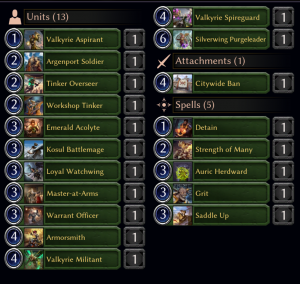 Even with three slots occupied by those cards, I still wound up having to play some really subpar units. I’ll be honest: I was not super thrilled about either of these. In the end, the tiebreaker between the two was that Rizahn is better than Slimespitter slug when I am the one playing lots of flyers. 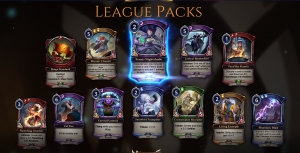 I wound up 5-5 in ranked after the first week. Ouch. So much for any dreams of a top-50 finish. 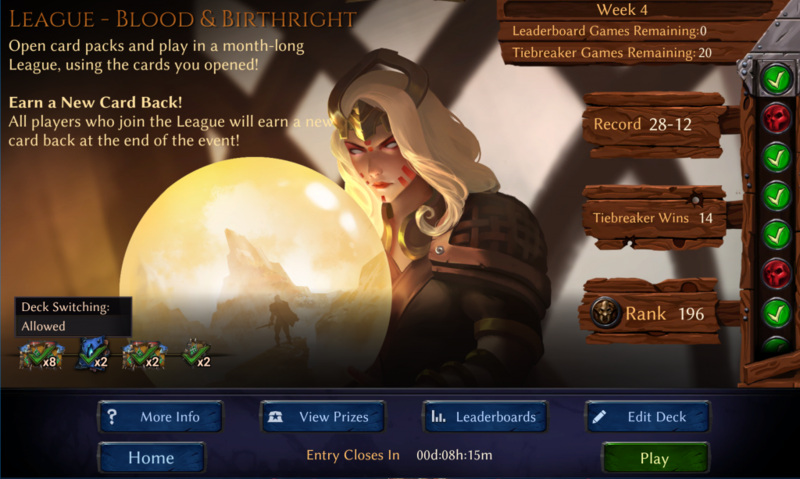 As is tradition, I fared much better in my tiebreakers, going 14-6. Right away, I’m thrilled by the Aerial Attendant and the brace of Valkyries that come with. Two copies of Ironclad Oath is more than I’d like to run, but one is a solid option. Deadly Confrontation is a potentially powerful Shadow card, but the triple influence cost means I certainly wouldn’t be able to splash anything in that deck. Plus, I double checked, and I did not get a single playable Unseen in Shadow or Justice. 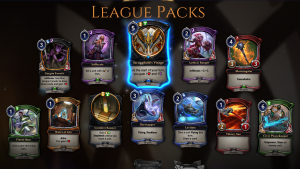 The cards that interested me were Finest Hour, Shugo Standard, Morningstar, two copies of Cut Ties, Valkyrie Denouncer, Suffocate, Bladewhirl, and Fenris Nighthsade, and Stonescar Pickaxe. Bereaved Stranger just doesn’t pack enough beef for its cost, and I didn’t have any other strangers to pair with it. 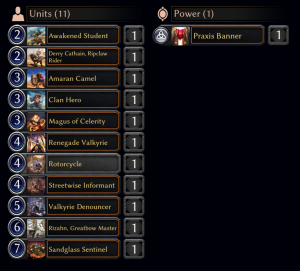 The main advantage of this deck is that I get to play a huge number of great units. In the early weeks, my Shadow pool was severely lacking in removal, but that issue was solved in the latter half of the month. While I don’t have many weapons, my evasive threats are mostly powerful enough on their own to get the job done without any help. The plan is really just to slam big threats over and over until my opponent runs out of ways to deal with them. Slimespitter Slug is not at his best in the deck, being that I have such a high density of flyers myself, but he’s still worthy of an inclusion as a backup plan. Ultimately, I think that the Argenport build just has the consistency and power advantage, even if Slimespitter Slug is a far worse bomb here, compared to Rizahn. 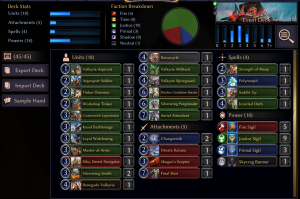 I’m not one to complain about a 70% win-rate in a CCG like this one, but it is disappointing to have started so poorly. Had I started, say, 12-4 instead of 8-8, I would have been in a great position to make the top 50, or even top 20. Still, finishing in the low 200s (my rank dropped a bit after this screenshot) is a fine place to be. 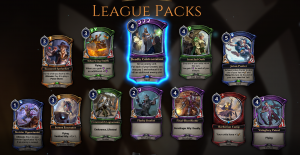 I was rewarded with a pile packs and a premium Time Flies (yay…). 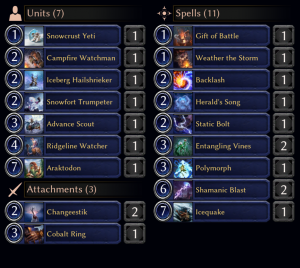 I was also able to make a last-minute push into draft masters after back-to-back drafts totaling 14-2. Finishing August ranked 200ish in sealed and 52nd in draft is a pretty solid month, considering I didn’t have tons of playtime invested. 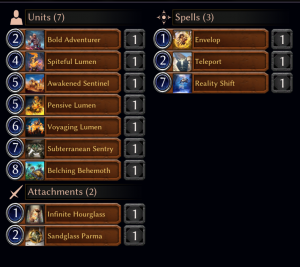 I’m finally settled into this draft format, I think, and my win-rate has gone way up despite my playtime going down. Next up will be an article focused on September’s sealed build, and why I’ve chosen to not play the first few weeks. 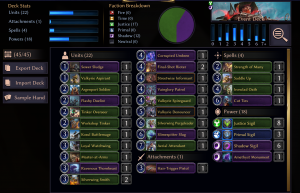 I’ll round out the article with some discussion on draft, and some sample decklists with their records and why they deserved the records they got.